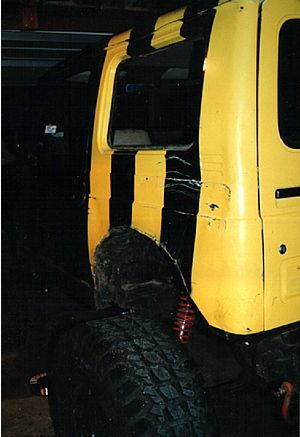 Obviously, from these pictures, you can see a small sample of the "custom body work" that has been so thoughtfully applied over the last couple years of heavy trail duty. So, we begin. Goodbye old friend, see you soon in another form. We start easy, first off with the hood, doors, and rear door. 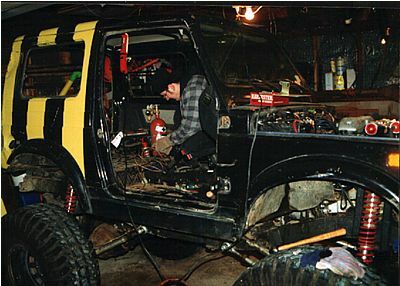 Then we remove all the interior seats, seatbelts, and trail items like hi-lift and CO2 tank. Next, off with the fenders. The left came off first, then we removed the right fender and grill parts together. We did learn something new on disassembling the Zooks. They liked to assemble everything with phillips screws that the centers always strip out. We used a 3/8" air impact gun with a #2 and #3 phillips bit. It removed all the screws except one without stripping the centers out. Another thing we came across... stuff in the air vent. 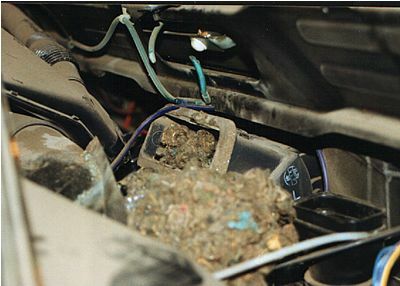 We pulled the dash cover off and found this pile of stuff in the air vent. looks like Mr. Mouse needed a place to stay for a while. One disadvantage to putting EFI on last year is the number of wires, hoses, and sensors that now clutter my once clean firewall. All this stuff needs to be moved, luckily it's all plugged in, even in non-EFI rigs. Just unplug it behind the right and left sides of the firewall. You'll also need to unplug the wiring that goes under the truck to the rear lights, trans and t-case. This may make it sound overly simple, but then simply disconnect the heater hoses, clutch cable, throttle cable, vacuum line for power brakes, and any of the metal brake and vacuum lines connected to the firewall. It actually goes very quick. All you have left is the fuel filler tube and body bolts. Remove these and the body can be lifted off the frame. 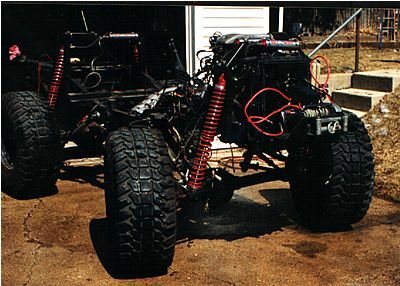 I had to cut my body off because my rear suspension went up into the rear of the truck. This whole body removal was done in only a few hours. A little time with some soap and water and you have.... So, what's next??? I picked up the "new" body from Rod's Used Samurai Parts in Iowa. The body cutting and preparation for paint will be in the next installment. This body will be tough to cut since it's so clean. The rockers are even like new, which is a miracle in the upper midwest.